A visit to family beekeeping. introduction to the mysterious life of bees. An experienced beekeeper will introduce you to his apiary, beekeeping and the importance of bees and bee products, a visit to the beehive with plantation of nectar producing plants, a presentation of an escaped swarm (short multivision incl.) and a tasting of honey products. Lake Bled – one of Europe’s most beautiful Alpine resorts in Europe. Walk around the lake, sightseeing and ride with traditional wooden boat – Pletna to the small island where you can ring the wishing bell at the Church of the Assumption. When in Bled do not miss to try their famous cream cake, called “kremšnita”. Experience a ride with traditional hay cart called »lojtrnik« through the countryside of Žirovnica- a small but important Slovene municipality which represents the heart of Slovene culture and the cradle of beekeeping in Slovenia. A visit to the memorial apiary of Anton Janša. Janša is known as a pioneer of modern apiculture and a great expert in the field. He was educated as a painter, but was employed as a teacher of apiculture at the Habsburg court in Vienna. Today we celebrate The world Bee day that was named after him. Bled Castle. The most beautiful view of Bled Island, Bled in the wider Carnolian region extends from the castle of Bled. Experience the picturesque architecture of the castle in a museum collection depicting the historical development of Bled, its culture in the inhabitants. Get to know the traditional manual printing techniques at the castle printing works, fill the bottle of wine and close it with a seal wax at the castle wine cellarand see the wonderful forged products at the castle forger. Bohinj cheese, the most recognizable product of Bohinj is distinguished by its high quality and excellent aromatic taste. The cheese is hand-nourished. It is designed in a way that combines tradition, knowledge and more than a century of experience in cheese making. Tasting of the products in traditional cheese shop. Savica Waterfall, the natural spring of the Sava Bohinjka is a unique feature among the waterfalls in the world, since the water stream is already divided into hidden underground under two strands. The famous A-shaped waterfall with normal water comes to a plan at an altitude of 836 m and is 78 m high. Following a a well-protected tourist path, within a maximum of twenty minutes you will reach a waterfall. Experience a ride with traditional hay cart called »lojtrnik« through the countryside of Žirovnica- a small but important Slovene municipality which represents the heart of Slovene culture and the cradle of beekeeping in Slovenia. On the way visit to family beekeeping. Learn about mistyc life of bees. Enjoy interactive bees experience…enter the world of bee paradise. Tasting of their inovative products. Next is a stop at the memorial apiary of Anton Janša. Jansa is known as a pioneer of modern apiculture and a great expert in the field. He was educated as a painter, but was employed as the first teacher of apiculture at the Habsburg court in Vienna. Today his birthday, May 20th is celebrated as The world Bee day. 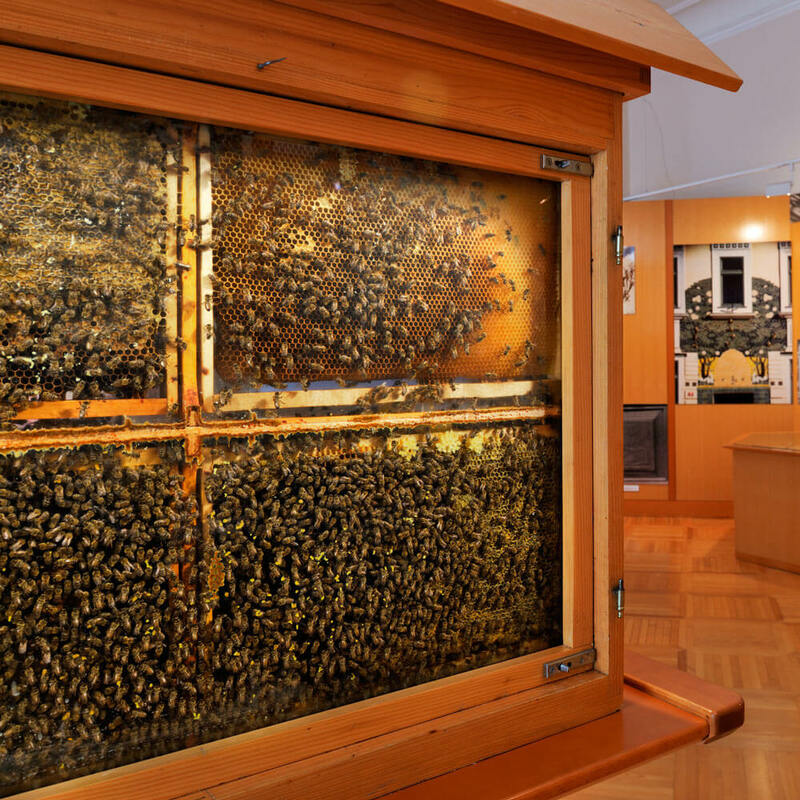 A visit to the Museum of Apiculture, where Slovenia’s entire beekeeping heritage is presented with a special emphasis on the 18th and 19th centuries and where they store more than 600 original hive front panels. 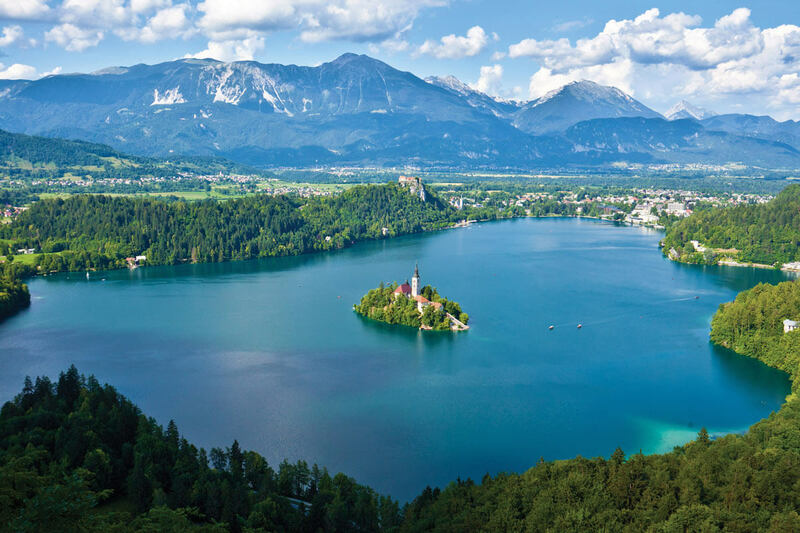 Lake Bled – one of Europe’s most beautiful Alpine resorts in Europe. Walk around the lake, sightseeing and ride with traditional wooden boat – Pletna to the small island where you can ring the bell at the Church of the Assumption for good luck. When in Bled do not miss to try their famous cream cake, called “kremšnita”. Overnight in hotel/tourist farm in local area. Experience a ride with traditional hay cart called »lojtrnik« through the countryside of Žirovnica- a small but important Slovene municipality which represents the heart of Slovene culture and the cradle of beekeeping in Slovenia. On the way visit at family beekeeping. Learn about mistyc life of bees. Enjoy interactive bees experience…enter the world of bee paradise. Tasting of their inovative products. Next is a stop at the memorial apiary of Anton Janša. Jansa is known as a pioneer of modern apiculture and a great expert in the field. He was educated as a painter, but was employed as the first teacher of apiculture at the Habsburg court in Vienna. Today his birthday, May 20th is celebrated as The world Bee day. A visit to the Museum of Apiculture, where Slovenia’s entire beekeeping heritage is presented with a special emphasis on the 18th and 19th centuries. There more than 600 original hive front panels on display. Kekec Land. In the protected shelter of the mountains there is a hidden place where shepherd Kekec and other characters from Josip Vandot famous book come to life. Experience a 2-hour adventure in the hidden Kekec Land, where Kekec still serves shepherd style lunch. The wild woman Pehta will tell you some secrets about healing herbs and maybe you can meet the wild hunter Bedanc. Alpine museum. Slovenian Alpine Museum in Mojstrana tells a story about climbing the highest mountain peaks in Slovenia and worldwide. In the museum the past and the future go hand in hand. A rich collection of items with diverse historical stories, rich photographic and archive material, and a comprehensive professional library give the visitor the chance to grasp the popularity and importance of the mountaineering activity in the Slovenian territory. The permanent exhibition is designed to take you on a tour – a mountain climb – through the history of mountaineering in Slovenia. A visit to family beekeeping where they combine traditional knowledge with modern content. 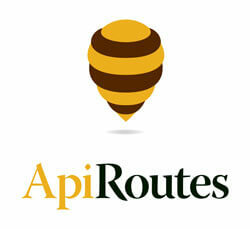 The interactive beehive and inovative bee products are worth experiencing. Stop at the Anton Janša’s memorial apiary. Anton Janša is known as a pioneer of modern apiculture and a great expert in the field. He was educated as a painter, but was employed as the first teacher of apiculture at the Habsburg court in Vienna. Today his birthday, May 20th is celebrated as The world Bee day. Prices are valid from Januray 2018. 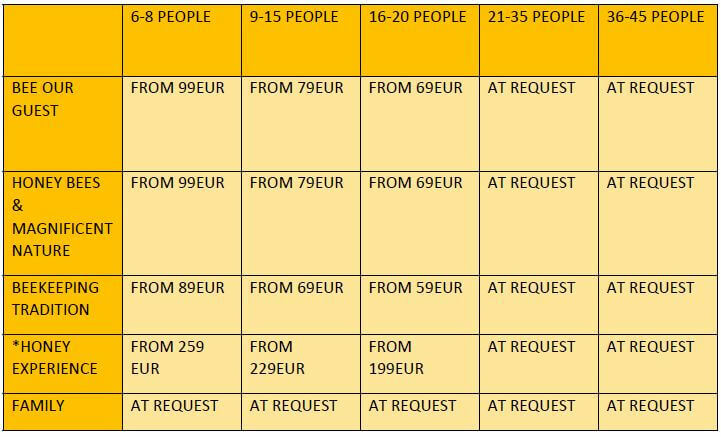 Price includes all visits as per programme, lunch and transporatation.